When I first got online about 15 years ago, it was a pretty wild place, both in terms of design and culture. There was very little continuity or uniformity to be found. And everybody was as anonymous as they wanted to be. Everyone who was building anything personal online was following nobody’s rules but their own. Many websites were vibrant and lurid and strange. And I liked it. I remember dark sites full of bad poetry in luminescent green text. Other sites were like being lost in vast and lightless subterranean rooms. You had to feel your way through the darkness with your mouse, as text and images appeared, linking and luring you farther into cyberspace. Which generally meant more bad poetry. Gradually, the template builders appeared, staggering from the subsumed ruins of Geocities bearing design sets resembling styrofoam cheeseburger boxes, and a new strip mall Internet began to take form. I lamented the loss of out individuality even then, having no idea how much worse it was likely to get. Because millions of people were poised to swerve – one foot on the brake and fervently gripping their pocketable, plasticized brains – onto the information highway, with no skills or inclination to make anything to represent themselves. Now look at what we’ve got. A megalopolis of shoeboxes, over half a billion strong, with little creativity involved. Wait. I’m not saying that everyone who uses Facebook should have built a web site instead. 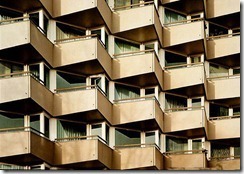 There’s nothing wrong with living in apartments that look like they were designed by bees. Unless that becomes the only place in town to live, which I’m afraid is the trend. That would be bad. Where are the custom hand-built homes of the Internet today? Getting hard to see amidst the cardboard forest. I miss the wild west manifest destiny days of the Web, with all its strange, colorful verbosity. And all the happy glassine metaphorical tubes of the Internets, ringing with clear, untangled anonymity. This entry was posted in facebook, gonzo life, internet by Kyle Kimberlin. Bookmark the permalink.